Building your own outdoor fire pit? Easy to install, this 18-inch burner ring is designed to create vibrant, natural-looking flames that bring your fire feature to life. Lazy, lounge-y summer nights by the backyard fire, gathered around a warm, glowing flame with your favorite people... can't you just picture it? Turn that vision into a reality with this Fire Pit Burner Ring by Celestial Fire Glass. Suitable for natural gas or propane installations, our fire pit burner has a double-ring cross-bar design to simulate the look of a natural fire. Unlike cheaper models, it's constructed of tough-as-nails stainless steel that won't rust or corrode - even in the outdoor elements. ** Note: If you are using a liquid propane system, an LP Air Mixer (150K BTU) is required (sold separately). 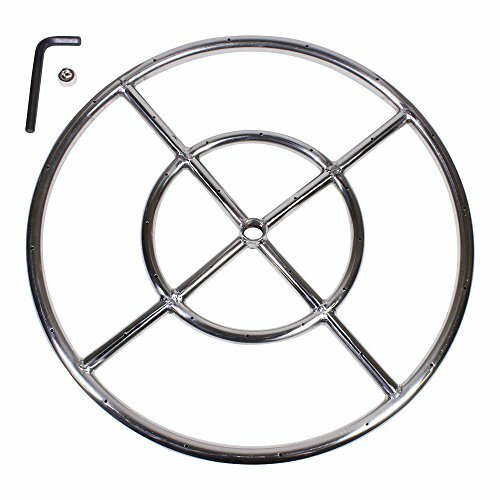 This Fire Pit Burner Ring can be installed with the help of a professional installer or DIY. Our experienced team of fire pit specialists is happy to answer your installation questions. Ready to light up your summer nights with your own backyard fire pit? Get started by ordering your Celestial Fire Glass Fire Pit Burner Ring today. For Bold, Concentrated Flames: Looking for fire pit accessories that ignite the "wow" factor? Our double-ring burner produces large flames right in the center of your pit for a dazzling light show. Creates a Beautiful, Natural-Looking Flame Pattern: The special cross bar design of our fire pit propane burner generates an even distribution of gas and flames. It's rated for up to 147,000 BTUs. Sturdy, Weatherproof Construction: Unlike some fire pit parts made of inferior metal that corrodes over time, our burner ring is made of solid #304 stainless steel to ensure a long life. Works With Natural Gas or Liquid Propane: With a reversible inlet plug that lets you position the burner holes up or down, your gas fire pit ring can be used with both types of fuel installations. Backed by Solid Customer Support: Our team is ready and waiting to answer your installation questions. Your kit includes a burner with 1/2" NPT threaded female inlet, one 1/2" inlet plug, & Allen wrench. If you have any questions about this product by Celestial Fire Glass, contact us by completing and submitting the form below. If you are looking for a specif part number, please include it with your message.